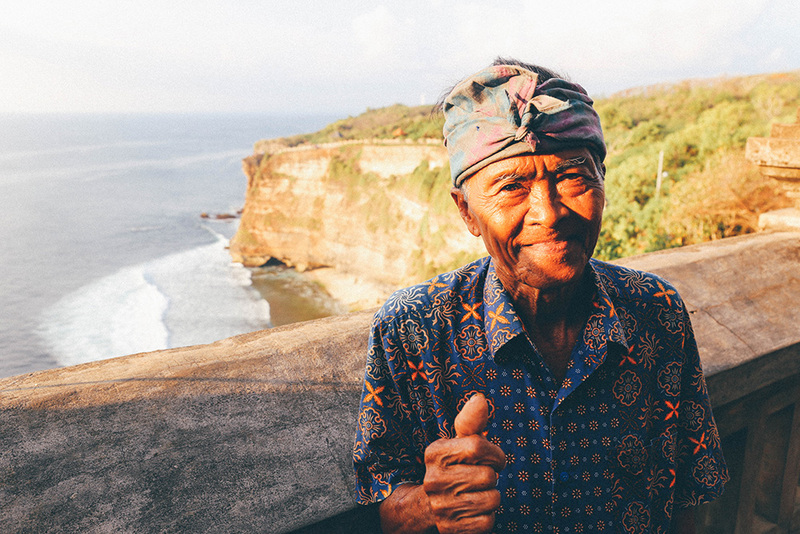 On a clifftop temple overlooking the southern coast of Bali, curious travellers gather at dusk to witness a ritual fire dance and chanting performance called Sanghyang that takes place over four acts. 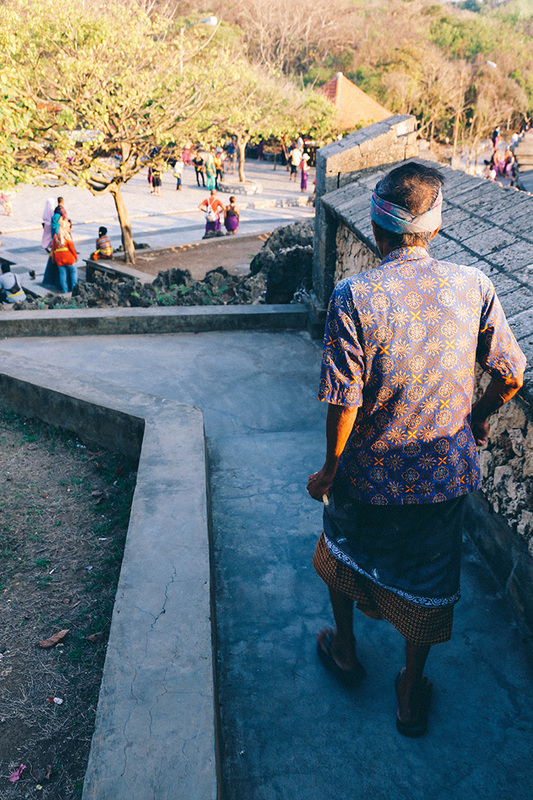 Presented at the front gate with a sash to tie our sarong, we are lead by a warm old local man along the cliffside. 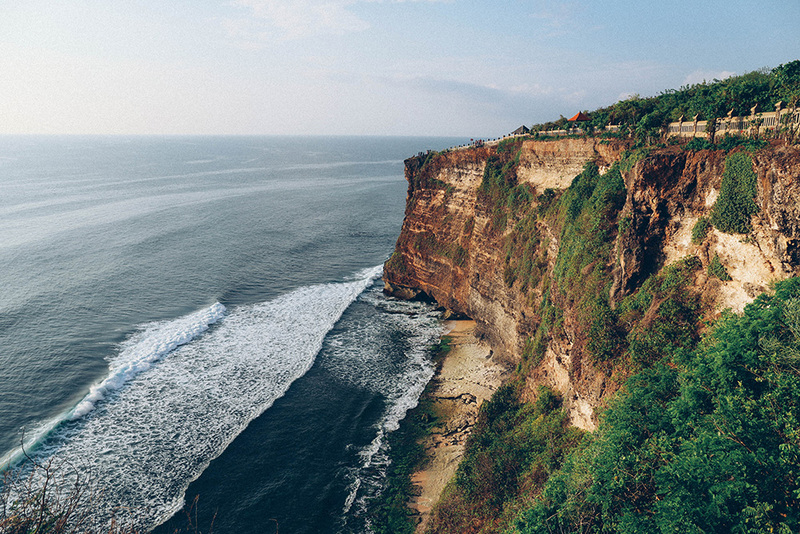 The Uluwatu waves roll on below. 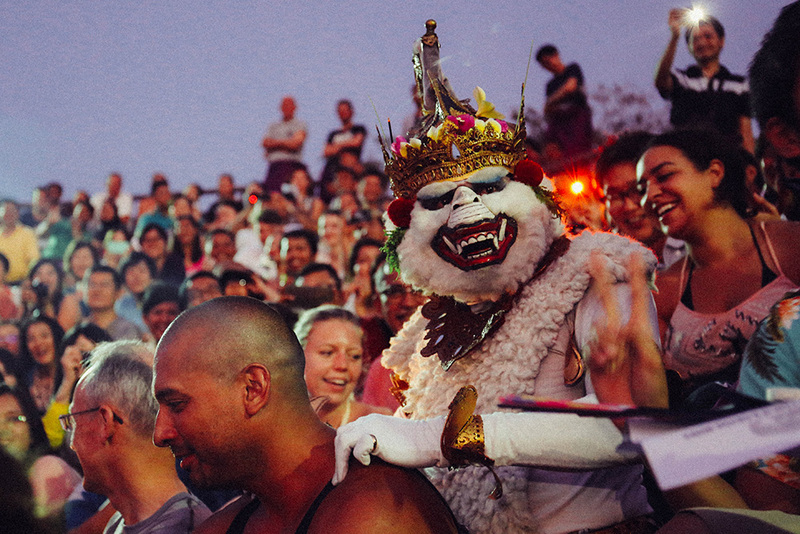 We take a front-row seat and wait with anticipation for the performance to begin. 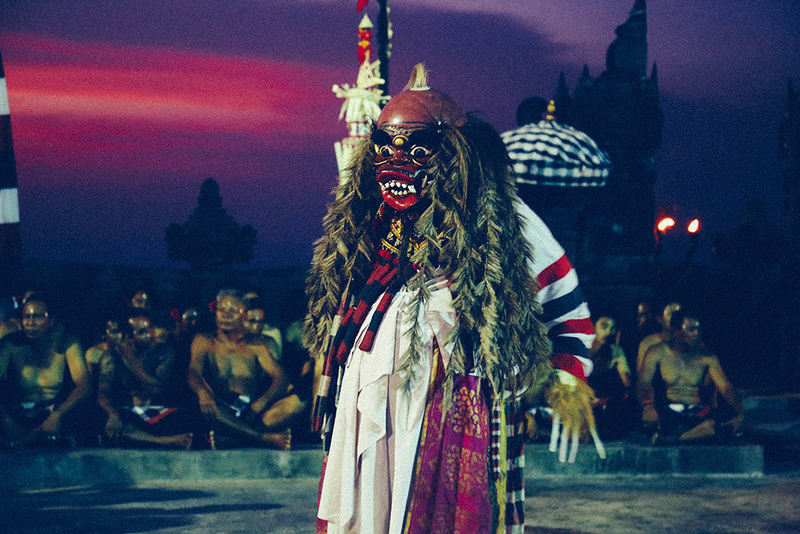 I am a tad excited as I’ve wanted to see a Kecak ceremony since witnessing this strange Balinese monkey dance in the documentary Baraka in the early 90s. 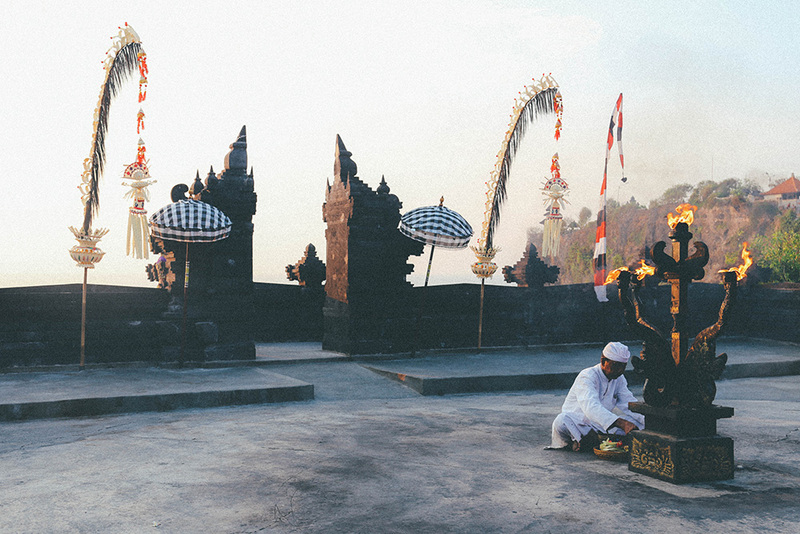 Quiet overcomes the temple as a white-robed man lights fire to a central stone carving. We can hear a growing chorus of chuck-a chuck-a chuck-a chuck-a chuck-a chuck-a as the chanters near the temple theatre. 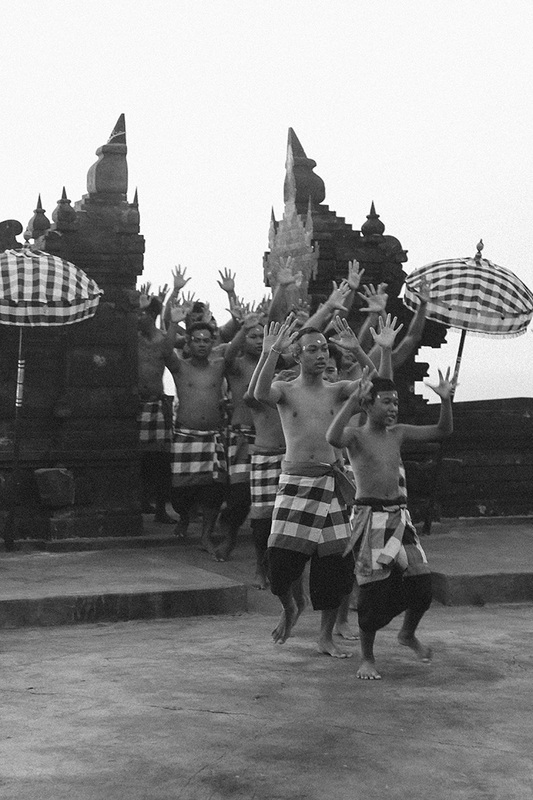 Seventy male dancers arrive through the cliffside entrance, arms raised, clucking in unison. 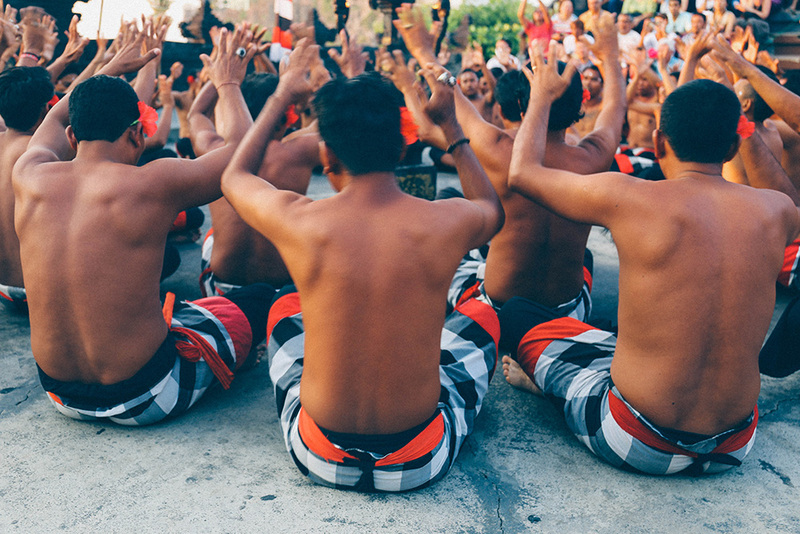 They create a circle around the central carving and seated, they continue the trance-like incantation, arms waving left and right, then thrust skywards, wrists twisting, chuck-a chuck-a chuck-a chuck-a chuck-a chuck-a. 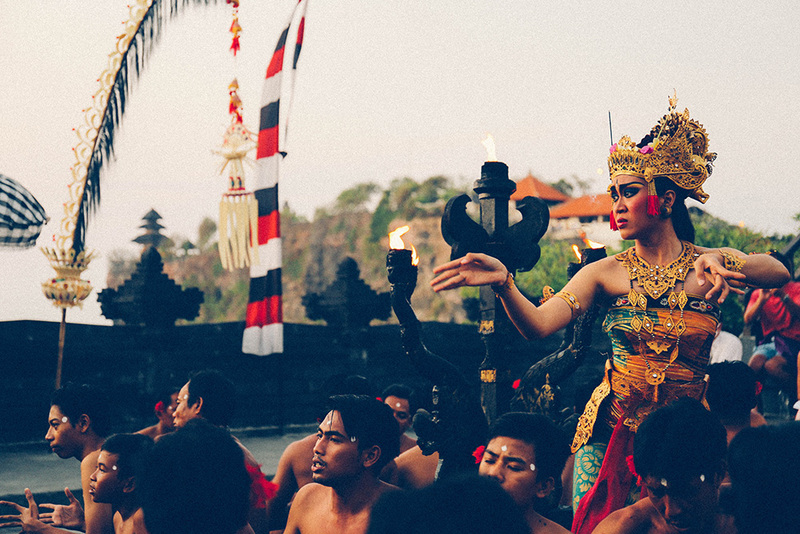 Two women with intricate gold headdresses and sari-like costumes enter and the first act begins. 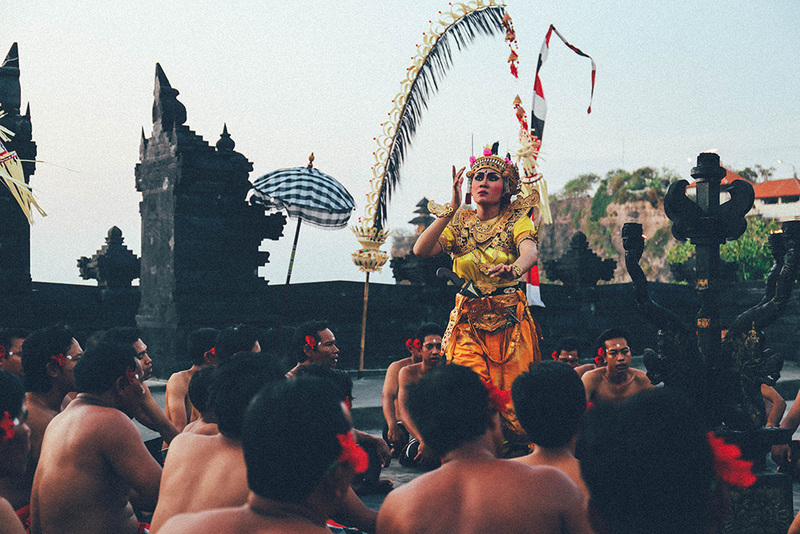 The story goes that Sita, the beautiful wife of a young exiled Prince, becomes desired by a demon King who uses magic powers to trick and kidnap the young Princess. The Prince and his younger brother set about rescuing her, with the help of an army of monkeys and their King, Hanoman. 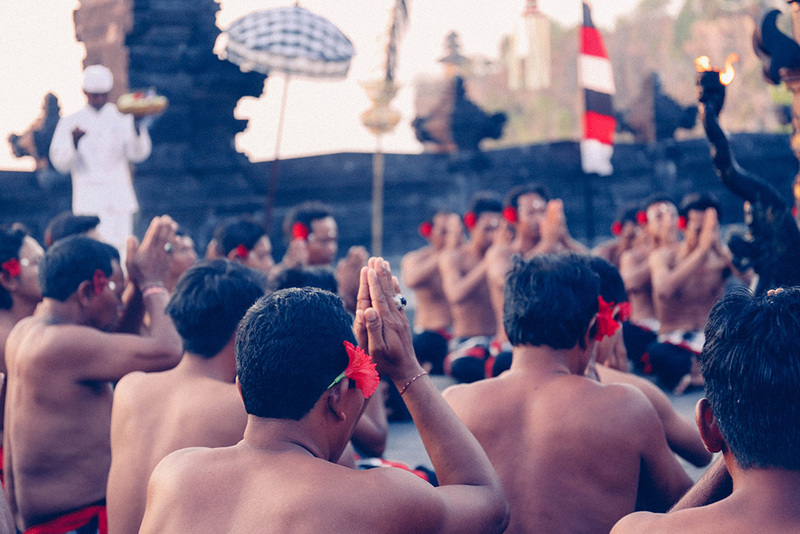 The chanting men represent the army of monkeys. 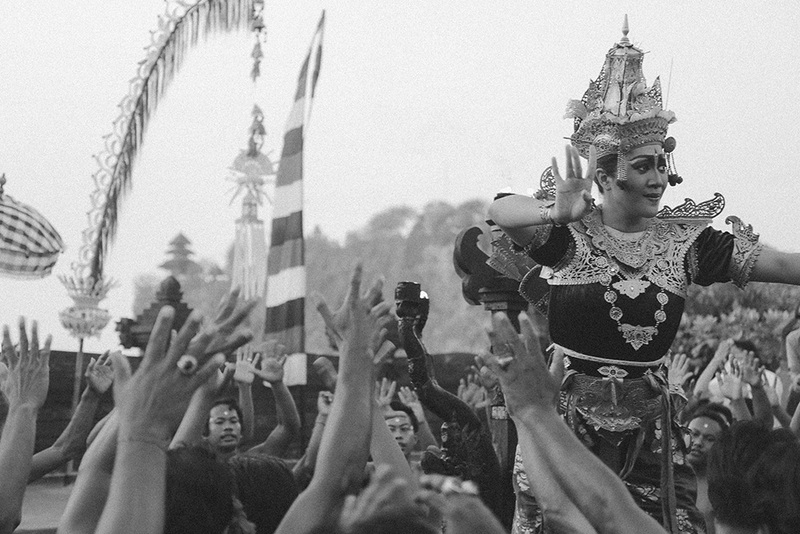 The Balinese dancing is as hypnotic as the chanting, as the women twist and dip their wrists, and play out the drama with their eyes, looking sad and defeated, or triumphant and assured, depending on the way the plot turns. 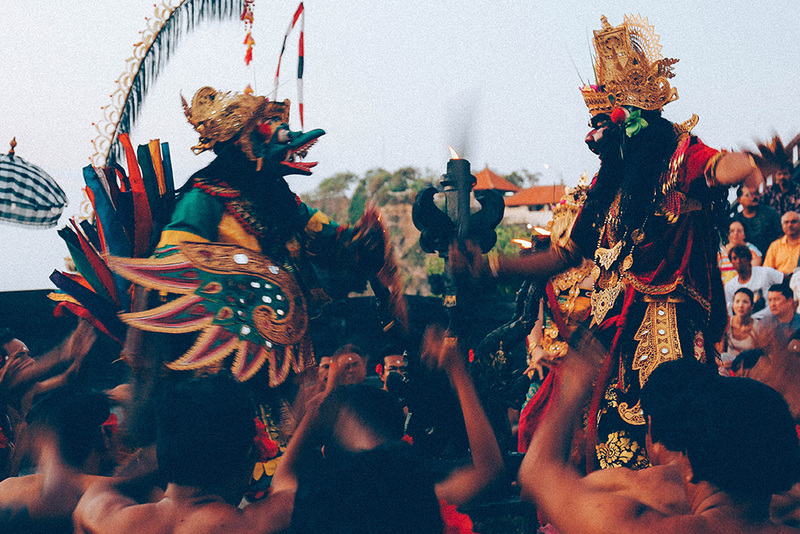 There are battles and jousts and a fair dose of comic relief as well. 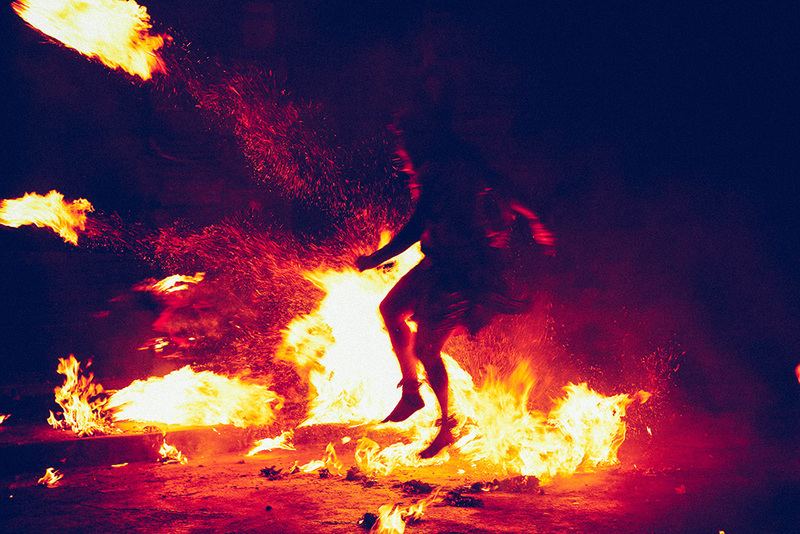 After the sun has set there is actual fire dancing too, as flames are kicked around the temple by the barefooted performers. 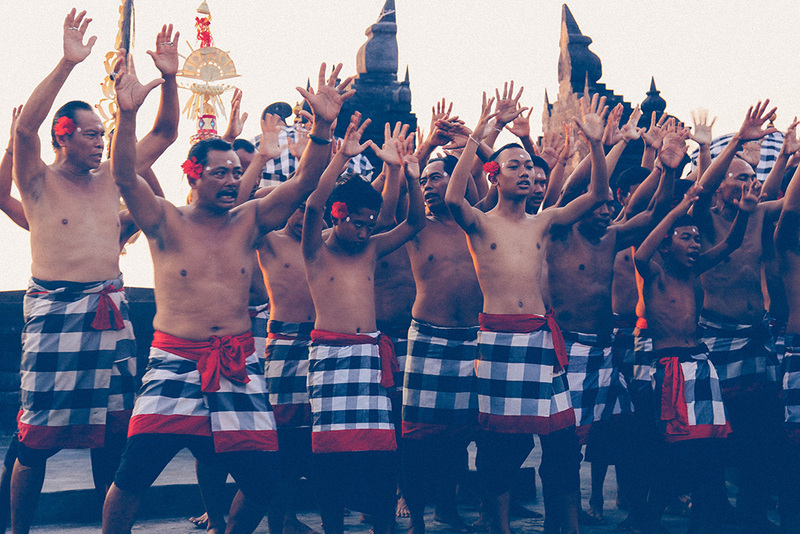 It’s hard to tell how much of this performance is traditional and how much has been altered for the paying public expecting a spectacle, but it is enchanting all the same, and certainly holds elements from the original Kecak ceremonial dances that began in the 1930s.